This is a simple, tasty side dish to add to your menu. I've adapted it from Marcella Hazan's recipes for other vegetables. It tastes GREAT with Brussel Sprouts. Broccoli is good too. Boil Brussel Sprouts for 10-15 minutes depending on desired crunchiness. Add grated parmesan cheese if desired. Let them sit for a little bit after they are finished cooking to maximize the flavor. Yummy cold as leftovers too! I love this dish! I like to saute shallots in the olive oil, then add garlic and brussel sprouts. Occasionally I'll also add chopped, toasted walnuts. If you like Brussel Sprouts, you'll love this dish. I cooked it in a wok, which was a poor choice. Should have fried the sprouts in a wide pan to really get them all crispy. Will do it next time. Made this one last night for dinner. It was the first time I worked with Brussel Sprouts and I am glad I did. Delicious Recipe! 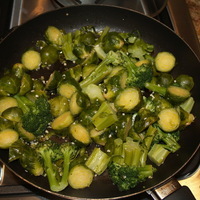 I just made this the other night...sauteing with oil, chopped garlic, salt & pepper is my standard way of cooking many green (and often leafy) vegetables, including brussel sprouts, broccoli, asparagus, & most Chinese/Asian green leafy vegetables. I've even done this with salad/iceberg lettuce that is starting to get a little wilted. If you want an Asian flavor, add a dash of oyster sauce or soy sauce and sesame oil at the very end. I usually DON'T blanch/boil the brussel sprouts--just clean (the water clinging to it helps it cook), cut each sprout in 1/2, and toss into the hot oil/garlic in the pan. Add liquid (water or broth or even white wine) a little at a time until sprouts are soft enough and have browned a bit. Cooking it this way ensures more caramelized/crisp sprouts. I love sauteed brussel sprouts! They are a requested dish at every Thanksgiving meal at my house. The main difference in yours and mine is that I simply shred raw sprouts, sautee them in olive oil and garlic and add roasted pignoli nuts to finish them (along with salt and freshly ground pepper to taste.) Everyone who tries them becomes a convert, even those who say they hate brussel sprouts! They are so sweet and yummy! Added celery and onion. A day or so later made a delicious omelette with the leftovers! Have been looking for a simple brussel sprouts recipe & this knocks it outta the ballpark. Thanks!!! Thanks for the glowing review, Kate! Glad you enjoyed it. I just used the sprouts, wish I had made more, kids ate them all. I am always curious about brussel sprouts. I think this recipe is a good first to try. I think Brussel Sprouts get a bad rap. I love the addition of the garlic. I think simple is better. I cant wait to try this with broccoli. I hope you enjoy them Veronica. I LOVE brussels sprouts. I love vegetables and this one looks easy and delicious! Added to my "must try" list. Thanks John! I love vegetables and this one looks easy and delicious! Added to my "must try" list. Thanks John! Sometimes simple is the best! I hope you enjoy them Les. Hey John! Thanks to this recipe (with shallots added) my kids ate brussel sprouts for the first time. Jordyn said, "Wow, these are actually really good." Have you tried making this recipe with other vegetables? What do you think would work?